Faculty in charge: Yili Liu, Ph.D. The cognitive systems engineering lab is used in conducting controlled human lab experiments on a range of cognitive systems engineering research issues, including cognitive performance, mental workload, cognitive architecture, multitask performance, engineering aesthetics, cultural factors in design, and cognitive modeling. More than a dozen Ph.D. dissertations have been completed with their experimental components conducted at the lab. The lab facility changes depending on the needs of the experimental research being conducted at the time. Examples of the lab equipment include desk top computers, a driving simulator, and experimental devices designed for engineering aesthetic research. 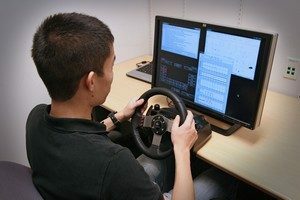 Here, a Ph.D. student is using computational cognitive models to simulate driver performing in-vehicle secondary tasks while driving. The model outputs could be used to evaluate and benchmark the usability of in-vehicle Human Machine Interfaces (HMI).